Lighting a candle is a language in itself. A language that we all understand. No translation needed. Something we do all over the world: light candles. Regardless of our original or adopted culture or religion. Because lighting candles creates atmosphere, spreads joy, gives people inspiration, hope, a sense of solidarity or a moment of reflection. That's why we all do it. And it's also why we all understand it. 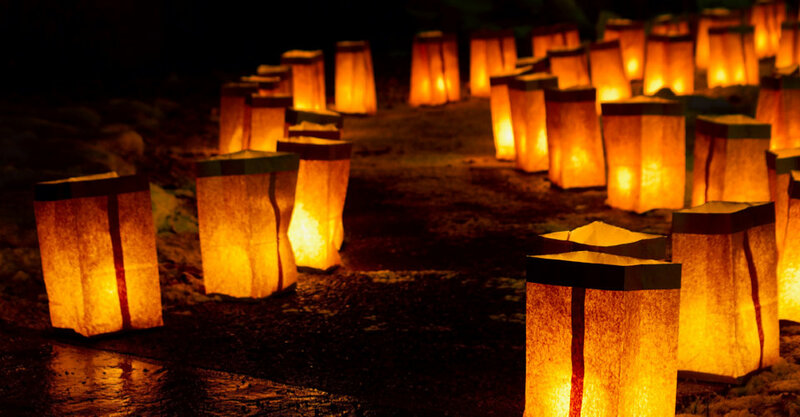 Luminaria is an outdoor light tradition originating from New Mexico and the American Southwest. It involves placing a candle inside a decorated or neutral paper bag, creating a beautiful lantern when the candle is lit. This tradition was originally practiced on Christmas Eve, but nowadays the ritual is practiced all over the world in connection with various events or ceremonies. Some people even use the beautiful paper lanterns just to create a friendly atmosphere. You can see why, because this ritual is very evocative. Do this outdoors, when night falls. Take a luminaria bag (a paper bag made of a fire-retardant material) and unfold it. If you don't have one of these, you can use some other form of lantern instead. Put a little sand in the bottom and then put your candle inside. So light a candle... for someone you love, for a special memory, for your hopes and dreams, for peace, for solidarity, for your loved ones or simply for a moment of reflection.